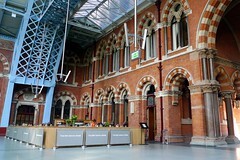 A pub on the upper concourse of St Pancras International Station, in front of the Eurostar platforms. Nestled in the corner of St Pancras station, the terrace of this pub overlooks busy King's Cross Road, while another seating area at the back (with some patio heaters, but can get chilly as the evenings go on), under the grand arched roof of the station (and therefore non-smoking), is at the back end of the Eurostar platforms. There is a smaller bar operating here sometimes. Inside is a series of four high-ceilinged linked rooms, one of which is dedicated to dining only. The room to the east side of the bar is the cosiest, away from the cold air coming in both from the outside (by the main bar itself) and the station (by the kitchen). On a Friday evening in November, a date when they were hosting a small beer festival (at their secondary bar), the place was completely rammed and the large group Ewan was with had to wait a while for a table to become available, slowly spreading themselves out around the room next to the kitchen, where the largest tables can be found. Banquette seating runs around the wall opposite the kitchen area. On the main bar, regular beers were Adnam's Broadside (£3/pint), London Pride, Sharp's Doom Bar, and a special ale brewed by Sharp's for this pub, Betjeman Ale. Several of the handpulls ran out at various times but most were restored over the course of the evening. The pub menu photo stuck to pub basics (burgers, fish & chips, steak) as well as more adventurous dishes. Most mains are priced around £10, with sandwiches at £7 (served with chips) and a small selection of starters and desserts (around £6). Food orders are taken by the serving staff, though catching their attention on such a busy evening proved difficult, and they never did return to collect payment, despite our repeated requests. Ewan's ploughman's lunch (£7.50) came promptly after ordering, with two slices of toasted granary bread cut into triangles, two hefty chunks of (mild) cheddar, a couple of different pickles, and a small leaf salad. Presentation was excellent, though there was no butter so the toast was a little dry, and the cheese rather too mild. However, my friend was happy with his ham hock terrine (£6). Verdict: As far as railway pubs go, this one is as good as any for a quick drink, especially if you can get a table in the cosy side room, but Ewan would probably not visit again unless he was in St Pancras to catch a train. Sarah visited in February 2011 and had a nice time, and reckons this pub is a good standby. Three Meantime Brewery beers were on, and a pint of Meantime Pale Ale was Ã‚Â£3.95. Last visited by Ewan and others, September 2011. Opening hours taken from website, November 2008. Last edited 2013-05-10 06:45:55 (version 13; diff). List all versions. Page last edited 2013-05-10 06:45:55 (version 13).